Framed Wolftrax Alloy 2.0 Deore Fat Bike 26"
Enter the game changer. From Framed Bikes comes the Wolftrax Alloy. 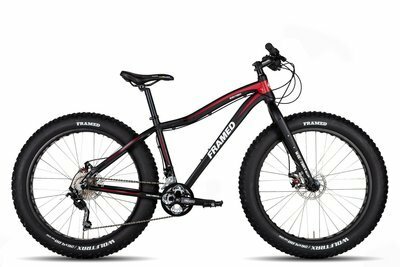 This bike is primed to blaze trail and crush terrain, stocked with 26 x 4" fat tires with the versatility to upgrade to a 4.8" wide tire. This go everywhere, do anything fat bike is the crown jewel of the Framed alloy fat line up. No matter if it's in deep snow, loose dirt, sharp rocks, or wet roots. The Wolftrax Alloy will handle it all with ease. All in all, the Wolftrax Alloy is a low maintenance cross country focused fat bike for the no nonsense all season rider. The frame is our most evolved alloy frame to date, constructed using a hydroforming process that nets a size specific tube set for every bike. Material is minimized where it's not needed and increased where required. This creates a lighter weight frame focused on delivering power transfer and improving the feel of the ride.